In the 1980’s, Jay established his Ashokan Fiddle & Dance Camps, a world-renowned destination for enthusiasts of American music and dance traditions. Within a few years, Molly had become a partner in designing and running these programs, which are still going strong. Around the same time, filmmaker Ken Burns selected Jay’s Ashokan Farewell as the main theme of his landmark PBS documentary, The Civil War. Now considered an American “folk” classic, the tune is played by fiddlers and classical musicians worldwide. 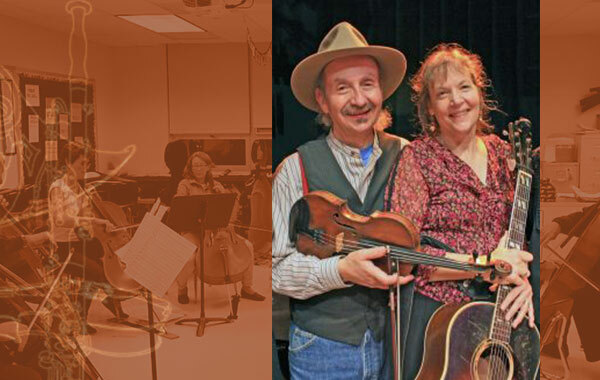 Beginning in 1991 (the year they were married), Jay and Molly produced several records, featuring such diverse genres as Stephen Foster songs and romantic fiddle music from Appalachian, Scandinavian, Celtic, Klezmer and swing traditions. More recently, their style has taken a slightly different direction: American dance music with a focus on country blues and swing, including more of the beautiful waltzes that have become their signature pieces. Jay and Molly have appeared on CBS Good Morning, The Rosie O’Donnell Show, All Things Considered, A Prairie Home Companion, and the BBC’s Transatlantic Sessions. In recent years, the duo has reached an ever widening audience through their television and radio appearances and through their work on film soundtracks and a host of Ken Burns’ PBS documentaries. They’ve had the honor of performing at the White House for two sitting Presidents and continue to tour extensively, delighting audiences across the country. Jay Ungar and Molly Mason play music from the heart which reminds us of the best in all of us. Jay and Molly make music that is simple and overwhelming . . . joyful and full of feeling . . . an apotheosis of American traditional music.